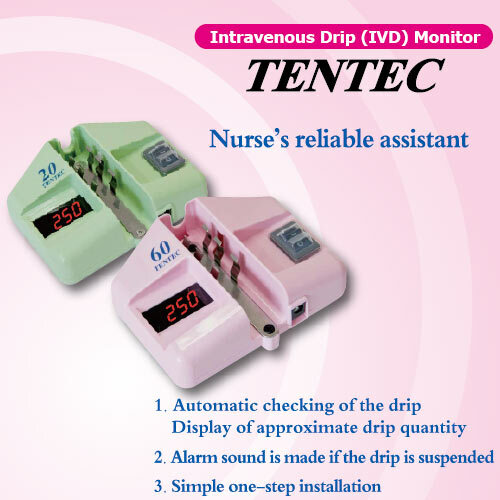 TENTEC automatically monitors the Intravenous Drip (IVD), and displays the approximate flow rate of dripping. An alarm will let you know when the drips stop or flow rate is too much. The TENTEC is the flow rate monitor system. An infrared radiation LED and sensor constantly detects the IVD and displays the flow rate (ml per hour). If IVD stops or flows too much, an “Error” indication is displayed and a warning sound is made to the administrator of the device. After IVD rate is corrected, the TENTEC monitors the flow-rate again. The operation of the infusion pump and syringe pump requires special training, but there is no need for special training and settings to use the TENTEC. From the moment it is switched ON, The TENTEC starts to detect the IVD and display the flow-rate of drip after four drops have fallen, and constantly monitors the drip until the power is turned off. As the battery case is separated from the device itself, the TENTEC is at its smallest and lightest with a whole unit weight of 150g. The AC-DC adapter can also be used. TENTEC can be mounted to any general IV chamber（20drops=1ml, 60drops=1ml, 15drops＝1ml）. A special carrier and mount adapter for the installation aren’t required. As the TENTEC unit has exclusive applicable infusion sets with the drip chamber of 20drops, 60drops and 15drops, and there are no need to switch a mode of drips or adjust the drip, human error in choosing the IV chamber can be prevented. Both batteries and an AC-DC adapter are available. The battery life of AA batteries is 30 hours with continuous operation. An alarming lamp warning of low battery level flashes when the batteries need to be replaced. Using dry-cell batteries aren’t affected by electric power failure and also the device is free to be moved. TENTEC aims to be used as an assisted IVD monitoring system to monitor the infusion rate of an intravenous drip infusion set. It displays the flow-rate of each drip passing through the drip chamber with three digits on the LED indicator. If the flow-rate of the drip is beyond the permissible range, “Error” is displayed on the indicator and a warning sound is made. TENTEC can be used for hospital and home medical care. It functions as a monitoring tool, but does not control the infusion rate of the drip through the drip chamber. The system unit is made from acrylonitrile butadiene styrene (ABS). All electric parts inside the device are low-voltage. Copyright(c) TENTEC 2015 All Rights Reserved.